Le District, Battery Park City’s French answer to Eataly, has continued to sharpen its casual food offerings, in addition to honing the three restaurants on the premises. Latest is a french fry counter, which, in contrast to the city’s other spud establishments, offers distinguished glasses of wine to wash them down. A modest 10 sauces are offered, topping French fries more delicate and browner than most. One of three special offerings, the so-called poutine Canadienne ($8.95) comes in a recyclable paper boat, and represents a decidedly Gallic take on the dish. Thus the curds are smaller and smoother, the gravy really a translucent demi-glace, and sautéed green onions on top. 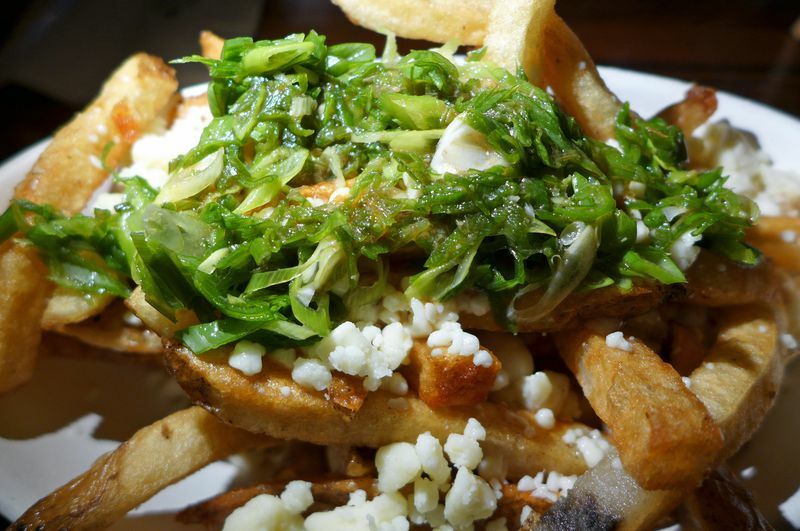 The serving is generous enough that Bar A Frites’ poutine constitutes an entire meal.